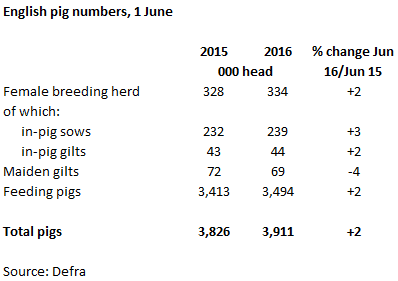 UK - Defra figures from the 1 June English pig survey show a surprising increase in the total pig herd, with reported numbers up 2 per cent, to 3.9 million head. This follows a decrease in these figures in June 2015, and the numbers are still behind levels recorded in June 2014. The apparent increase comes at a time when industry reports are telling of a tightening of supplies, which has contributed to supporting the pig price, which has been increasing since April. Slaughtering figures for H1 2016 show that throughputs were only marginally up on 2015 levels, although levelling off more throughout the second quarter. This would further support what the industry is saying, regarding supplies tightening. The figures released by Defra would suggest that an increase in slaughterings might be recorded in the second half of the year. As with the total herd, the female breeding herd was reported to have increased by 2 per cent, to 334,000 head. Both the number of in-pig sows and in-pig gilts were up, by 3 per cent and 2 per cent respectively. However, the number of maiden gilts fell by 4 per cent, maybe suggesting that producers are not looking to replenish their breeding herds at the same rate. Given that sow slaughterings have been up in the first half of 2016, it is somewhat surprising to see an increase in the breeding herd. If correct, Defra figures would suggest that there might be an increase in supplies in the longer term.